Sometimes in life a person can have the right idea in mind, can choose a course of action for all of the right reasons, have with them the perfect compliment of associates to help them see to it their goals are met and even find the organizational hierarchy, which in other circumstances might balk at such a move, is in full support… and have it fail anyway. The role of the B-side of single releases is one of the most frequent topics – and criticisms – here on these pages. When it’s not being used to offer listeners a different facet of the artist’s abilities, but instead essentially duplicates the top-side in terms of style and approach, it seems like a wasted opportunity, depriving an artist the chance to diversify at little risk to their commercial prospects, since the A-side of the record will be where their strongest attributes and established sound are featured. But here we have Goree Carter, one of the most vibrant and exciting rockers on the scene whose uptempo blasts of pure narcotic rock ‘n’ roll positioned him as the unquestioned leader in that style, consciously attempting to expand his scope by giving us something different and unexpected. He pulls back on the bravado, shelves his usual storming guitar leads that requires you to strap yourself in before listening for your own safety, and replaces his trademarked swagger with a healthy measure of self-doubt in the story he presents and in the process shows us that… maybe a totally unimaginative exploitative carbon copy of what he did best might been the better choice after all. Seven decades down the line we don’t have any type of reliable sales figures for most of these releases. All we really have are a handful of trade paper charts (Billboard for how the best of them did nationally and Cash Box for narrower territorial regions across the country… both limited to just ten to fifteen spots a week) along with whatever fanciful hyperbole touting their own sales that record labels and artists issued over the years. So because of that we’re not exactly sure how commercially successful, or unsuccessful, Goree Carter was shaping up to be. In any event he never scored a national hit, nor do we see any verifiable regional action on his releases to this point. Freedom Records itself was just six months old in August 1949 and like most start-up independent companies they were trying to build up a network of distributors to get their product into every area and probably hadn’t yet been able to forge relationships with any promotional men to push their product to jukebox operators or the handful of radio dee-jays who played rock ‘n’ roll. In fact Freedom Records has had just one release to date – L. C. Williams’s country blues offering Ethel Mae – that made the Billboard charts. 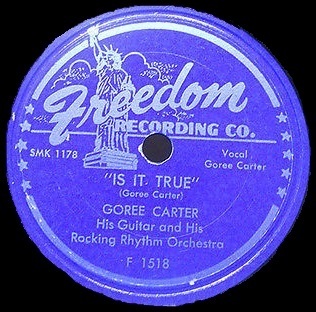 That it came on the back side of an even better record, Shout Baby Shout, that was squarely in the rock realm and done in a style that Goree Carter himself excelled in might be somewhat telling… if neither of them could score with that approach despite rock’s ever-increasing presence on the charts, maybe Freedom was just associated with distributors who were more attuned to the blues. But whatever the reason for his lack of confirmed commercial impact we’re left wondering just how close he might’ve come over the years to scoring a legitimate hit. Did any of his releases, at least the four to date he’s put out since April, move enough copies for Freedom to be excited about his chances at breaking through in the near future? Was Carter himself getting a strong reception to his material from audiences at whatever live gigs he was playing to feel it warranted further exploration into the same type of music he excelled in? Or were doubts beginning to creep in, giving everybody the sense that maybe something different was necessary to try and stir some more interest? In any case, his decision to branch out a bit stylistically made perfect sense on paper, especially for this release as it was coupled with one of his most scorching rockers, She’s Just Old Fashioned, thereby making any song which took a similar approach all but superfluous. Yet for all of its good intentions and interesting ideas Is It True suffers from one irrefutable fact – this just wasn’t what Goree Carter was cut out to sing. There are a whole lot of things to admire, even genuinely like, about this song and its performance. The band is now being called “Rocking Rhythm Orchestra”, as Freedom Records clearly wanted to establish them as being squarely in the midst of rock ‘n’ roll, which is only fair since they were unquestionably the best self-contained band IN rock ‘n’ roll at the time, but their old moniker, The Hep-Cats, was more than sufficient in describing just how “with it” they were musically. They’re a versatile bunch at any rate and while what they did best was pour on the gas instrumentally they were more than capable switching things up and offering an entirely different feel, as they do to good effect here. Conrad Johnson’s mournful saxophone leads it off, setting a reflective mood, sounding almost a little emotionally shaky at times which perfectly reflects the lyrical theme that’s forthcoming. He’s backed by Lonnie Lyons dancing right hand on the piano that adds color without detracting from the scene and because it’s so slow paced it’s already set itself apart from most of Carter’s tracks. You don’t need more than one guess to know this is a downbeat ballad we’re about to hear. The story itself is a fairly typical one for such songs – the narrator bemoaning a lost love – but where Is It True really stands out is in the details of his perspective. This isn’t Carter ruminating on his beloved leaving him as he nurses a drink in a lonely bar, confused and hurt by her decision for reasons he can’t – or won’t – understand. Nor is it a series of (often feeble) excuses that are designed to shift the blame away from him in this breakup rather than serve as an authentic autopsy for the failed relationship. No, in this Carter knows exactly who is at fault for the rift between them which ended their romance. It was his best friend. Yet Carter isn’t angry about this, he’s not screaming vengeance and he’s not out for blood. There are no vitriolic put-downs of his buddy, nor even his girl whose head was turned by his pal’s charms and good looks. By all rights though he probably SHOULD be a little more perturbed at his girlfriend since she was still ostensibly with Goree while this illicit romance was blossoming. Carter himself admits he knew it all along, even as it was left up to others to inform him that she was slipping around. But that only confirmed his suspicions, something that I suppose most guys in a similar situation would attest to. When the sparks are dying out you probably don’t need all of the grim details laid out before you to know that something is amiss. Carter discloses all of this to us in drawn-out fashion, which helps build the tension. He doesn’t even make his first appearance vocally until fifty seconds in, after the extended instrumental prelude has fully established the somber mood. Even then, as he reveals the details in a halting tone, he takes his time before getting to each point, letting the anticipation of what’s coming work to his advantage. He asks if it’s true what he’s heard, that his “woman’s got another guy”, but it’s another forty seconds before he concedes that she just told him she’s leaving. The second half of the record lets us in on the reason why, that she’s got the hots for his best friend, but we’re left hanging in suspense before finding out that he’s not going to hunt him down in whatever bar they might be cozied up in to settle the score. In fact, he doesn’t address his friend at all, clearly not placing the blame on him, nor does he even divulge if his buddy has done anything to stab him in the back by encouraging these feelings in the girl. Though her leaving Carter would indicate that she’s indeed moving on with this other fella, it could just be she’s positioning herself to be with him by cutting all ties to Goree FIRST, in case his friend doesn’t want to do anything to hurt Carter more than he has to if his pal wants to be with her as much as she wants to be with him. Though these questions aren’t answered, and while it’s also lacking any sort of resolution that would satisfy our morbid curiosity about the aftermath of this messy tryst, the song is very well crafted… albeit for Andrew Tibbs, not Goree Carter. 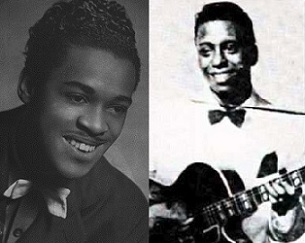 When we were first introduced to Tibbs, the teenaged gospel-trained vocal stalwart of Aristocrat Records back in December 1948 on Union Man Blues, we said how he was already profoundly impacted by Roy Brown, even though Brown’s debut, Good Rocking Tonight, which launched rock ‘n’ roll as a whole, had only just come out the same month Tibbs first entered the studio. But that’s teenagers for you. At that age you’re up on all of the latest musical and cultural developments seemingly the second they happen, whereas for those even just five or ten years older there’s an inevitable lag before you become fully aware of something and maybe even longer before you absorb it and begin to be really influenced by it. 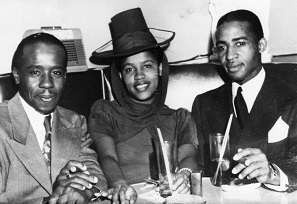 Goree Carter was a teenager himself and Andrew Tibbs, though recording halfway across the country, did have hits by this point and even if he hadn’t it’s not hard to envision that someone like Carter would have heard him, played his records and maybe, if Tibbs had toured the south, even seen him perform. He sure as hell HEARD him sing, that much we know with absolute certainty just by listening to this, as the debt owed to Tibbs entire vocal style on Is It True is so strong as to be called stylistic plagiarism. You might think, given the overall reverence we hold Tibbs’s singing in, that this would be a GOOD thing for Carter. Something to show just how interconnected rock ‘n’ roll really was, rather than just some loose knit amalgamation of disparate sounds, influences and ideas. In some ways, yes, it is good to see that concept reinforced so blatantly here, but in terms of Carter’s prospects as an artist this is a definite set-back of sorts, simply because he’s NOT Andrew Tibbs and certainly does not have Tibbs’s melodious pipes or the gospel training to be able to pull of such vocal mimicry. The basic problem here is Carter’s use of melisma, something which is a staple of gospel – the art of “worrying” a line, as they say… that is stretching out syllable over several notes which is designed to add depth of feeling and intensity to a performance. For Tibbs who was trained to sing by none other than gospel star Mahalia Jackson, and whose own father was a minister no less, this technique came as naturally as breathing, just as it would to Sam Cooke and Aretha Franklin down the line. But for Goree Carter, a kid from Texas who’d grown up listening to the blues, it was obviously an alien concept. He does his best to imitate Tibbs, sounding uncannily like him in tone at times, which is far removed from his more nasal exuberant singing style on the uptempo sides, but without understanding the nuances of how to use melisma properly it just comes across as sloppy and hackneyed, almost painful at times to get through which sinks any chance the song has to connect. It didn’t have to be this way. He could’ve ditched that technique altogether and replaced it with any number of other tricks, from utilizing a stuttering approach on certain lines, repeating phrases to drive their point home, or he could’ve simply eased off the first half of each line before amping up his voice, and in the process increasing his anguish, for the payoffs. The effect he was going for – an increased emotional wallop – would’ve still been accomplished without committing to something that was simply out of his reach to convincingly pull off. It’s hard to criticize an artist we’ve come to see as one of the shining lights of the entire rock ‘n’ roll field for doing something that had the best intentions. The song itself and its conscious differences from his primary output shows an artist determined to be versatile, which is always deserving of praise. Even his appropriation of Andrew Tibbs’ vocal style is something more than understandable, not because he was cynically seeking to capitalize on Tibbs’ success but rather because like all young rock fans would attest, imitation is often the sincerest form of flattery. We get that and we respect it even. But that doesn’t help Carter’s OWN chances for success in this case, turning an otherwise fairly solid song into one that we’d generally seek to avoid. In this case the road to failure was paved with good intentions, showing in a way just why the ultimate successful destination all artists seek was far more difficult to get to than meets the eye. Leave a reply on "Goree Carter: “Is It True”"